On June 5 and 6, 2016 Eastern Australia experienced a once-in-30-years (or more) storm. This storm extended all the way from the coast of Queensland to Tasmania, a distance of more than 2,500 km. 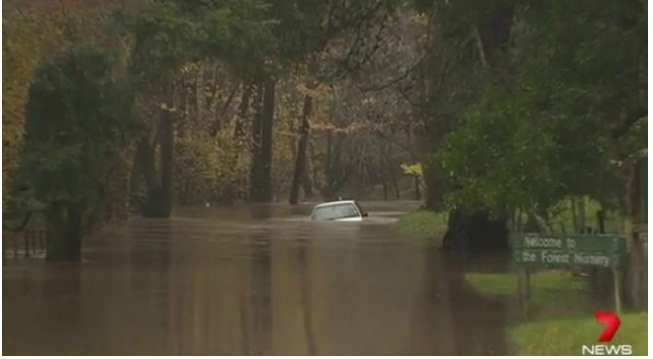 Severe flooding was experienced all down the east coast of Australia. 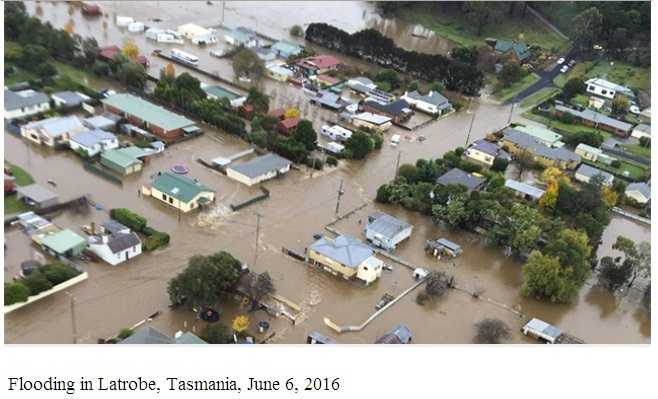 In Tasmania, every river was in flood at the same time, something that has never been recorded before in history. Some dairy farmers in Tasmania lost their entire herd of dairy cows, herds composed of hundreds of cows. 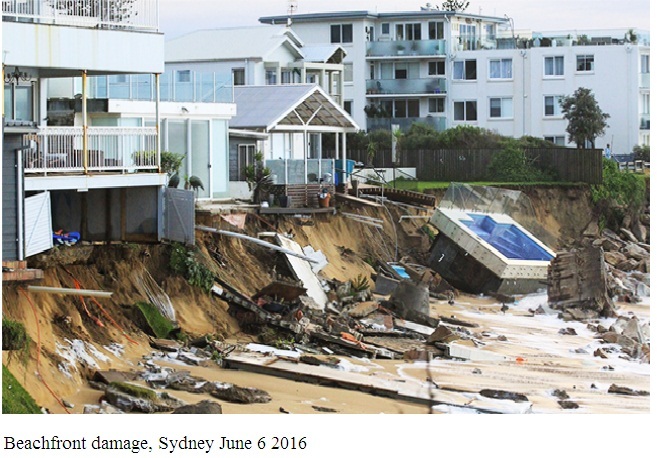 Another feature of the storm was the enormous oceanic swell that was experienced along the coast and the 'King Tide' on June 6, resulting in serious beachfront erosion around Sydney. There were also some isolated incidents of short bursts of cyclone-strength (hurricane-strength) winds. But statistically the world has not been warming since 1998. Furthermore, there was no temporary spike in temperatures worldwide or in the Pacific region in the period just before this storm. So that explanation was an obvious lie. "As the fierce storm continues along the east coast, do you worry such extreme weather is becoming more frequent?" Apparently the result was that more than 60% of respondents said, "Yes". What does all this mean? Well, a large proportion of the population has already been brainwashed to believe that man-made global warming, now called "Climate Change", is a serious threat. So, when an unusual weather event occurs, the obvious idea is to capitalize on that opportunity to reinforce people's belief in man-made global warming. The media is also linking "coastal erosion" with "climate change", an extension of Al Gore's predictions of 20-foot rises in sea level. Very few people have even heard of the predictions that we are due for an extended period of global cooling – this idea is simply not in the consciousness of most people. Western Australia was also hit by an extreme storm. The following two videos showing the Australian storms are on the excellent Youtube channel of David DuByne, called Adapt 3030. I'm not an expert in this area but I see at least 6 major pieces of evidence that reinforce the prediction that we are now entering a period of quite pronounced global cooling. 1. The words of Professor Lindzen concerning storminess. "we're talking of a few tenths of a degree change in temperature. None of it in the last eight years, by the way. And if we had warming, it should be accomplished by less storminess. But because the temperature itself is so unspectacular, we have developed all sorts of fear of prospect scenarios -- of flooding, of plague, of increased storminess when the physics says we should see less. ... I think it's mainly just like little kids locking themselves in dark closets to see how much they can scare each other and themselves." He was simply stating the standard meteorology textbook explanation of storminess. As Lindzen has explained elsewhere, a) storminess results from the temperature difference between the poles and the equatorial area of the world and, b) a warming climate results in a decreased temperature difference between the equator and the poles while a cooling climate results in an increase in this difference. In other words, a cooling climate results in more storminess. Records of the 1960 to 1997 period show a relative lack of storminess in Eastern USA. It is well-known that the sun experiences quite predictable cycles of activity. For example, there is an 11-year cycle, a 60-year cycle as well as other, longer cycles. Records of sun spot changes have been kept for hundreds of years, and sun spot changes are aligned with these cycles and other variations in the sun's activity, such as the strength of the sun's magnetic field, which extends far into space. It is also a well-established fact that historical records of solar activity clearly align with climate changes on earth. After analysing all this data, many scientists predict that we are soon going to enter a period of global cooling that will last about 3 decades (or, they say that we have already started to enter this period). They say there will be cooling for the next 15 years (approximately), reaching the coldest temperatures in about 2030, followed by gradual warming again for the next 15 years to return to today's temperatures in about 2045 or 2050. Some of these scientists say that the drop in temperature will be severe enough for this period to be described as a "mini ice age" that will be similar in severity to the 'Little Ice Age' that the world experienced for about 300 years between 1500 and 1800. You can read about these predictions at the links shown here. See also the left-hand side of this page for daily updates on the sunspot count - www.spaceweather.com and this page - http://www.vencoreweather.com/blog/2016/10/31/1040-am-sun-quiet-again-as-it-heads-towards-solar-minimum. I check the sunspot count almost every day. Note that the following three websites are supporters (propagandists, if you like) of the man-made global warming theory. They seem to grudgingly admit that a cooling period is highly likely soon but they try to minimize the extent of this cooling and state that it will be temporary, to be eventually overtaken by global warming resulting from CO2. However, they do provide good information on sun spots and the Maunder Minimum. The first two articles both add references to Michael Mann at the end of the articles, (as if working in co-ordination). 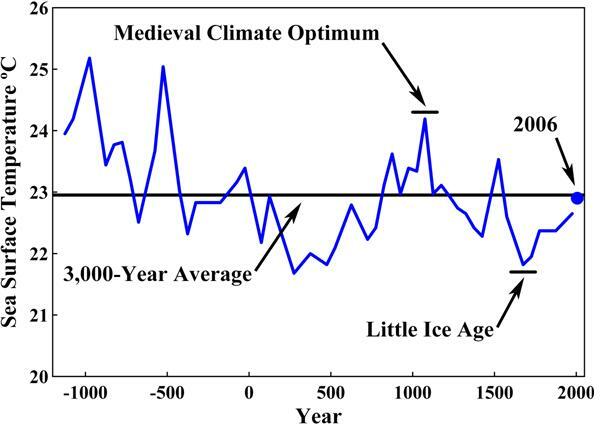 This is the same Michael Mann who produced the fraudulent "Hockey Stick" graph by virtually "eliminating" the Little Ice Age and the Medieval Climate Optimum from the historical record! His fraud has been proven beyond doubt. Basically, Svensmark and his colleagues have proven that it is the sun that determines temperature on earth via the formation of clouds, which are the major cooling mechanism of the earth. The more clouds, the more the cooling and the fewer the clouds, the more the earth is heated. Also see here for the work of Nir Shaviv and Jan Veltzer that links historical cosmic ray measurements with cloud formation and known past climate changes. Was the storm in Eastern Australia an isolated event, while the rest of the world was experiencing normal weather? Not at all! 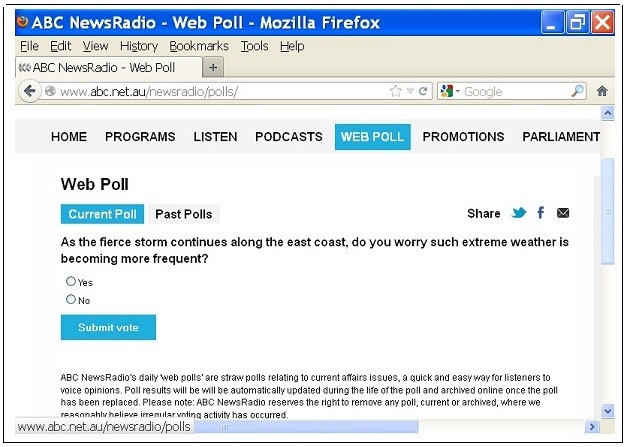 Not only Eastern but Western Australia were both experiencing extreme weather. Extreme weather and cases of unusual precipitation occurred all over the world during that week. Guatemala is in the tropics! Also look at this hail storm in China on June 14. All the video links below are to videos on the Youtube channel, Adapt 2030 at https://www.youtube.com/channel/UC-5dIHmtQzHIdNCs7-bEdCA. The videos below are just some of the videos on that channel.